Many schools have established relationships with educational travel companies who run their trips either in their home countries or abroad. For the school looking for agents in Africa, here is a guideline on how to know if the school travel agent will give you a stress-free tour. - Is the student travel agency a registered and licensed tour operator? It is the school's responsibility to find out if the agent is legal, licensed to do business and if need be bonded. We are in the internet age where any nice-looking website possibly on “copy & paste” may look like genuine. If you proceed to arrange your school’s travel via a non-licensed educational travel agent, remember you will have no legal leg to stand on if things would ever so wrong. - Are school tours his specialty or is he a “Jack Of All Tours” educational travel company? While we are in no way black listing student travel agents who also cater to different clientele – there is an element of security that comes from knowing that your student travel agent is specialized in schools travel. - Do the founders, management of the students travel agency have experience of dealing with students? Can they provide you with credible references of schools he has done tours for? - In your communicating with the school travel agent, are they always “yes,yes” just to get your business? You have your student’s wish-list but this must be guided by wise counseling from your educational tours agent - who should be able to give practical advice of things as you will find them on the ground and this may mean that he will overrule some of your needs and research findings but accept it knowing that he also has vested interests (his reputation & future business) in giving you a successful tour. - On the price of your school trip – is the student travel agency giving you the most competitive price in the market? Respect that the agency is in the business to make a profit but he should mutually respect that your students have a budget. However be on the look out for below-the-market prices which obviously mean corners are being cut. At the same time see what value-adding extras he is squeezing in your student travel deal. Examples are: A free slot for a teacher or a nett price that is inclusive of most tour-related ground costs. 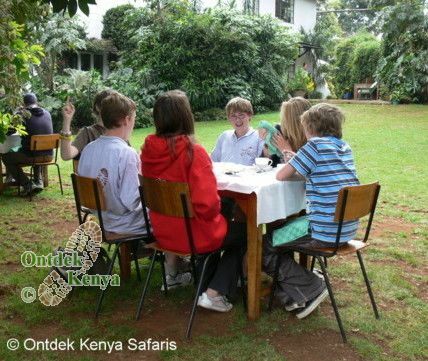 For a consultation on educational tours to Kenya contact Ontdek Kenya Safaris, a school travel agent with a wealth of experience in educational travel. See sample itineraries of our students travel to Kenya.